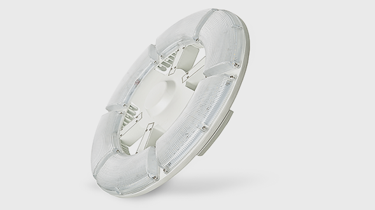 The Aleo SCB™ Series Slim-Profile Circular Dimmable LED High Bay delivers industry-leading performance with a durable, heavy-duty construction. Superior performance, ultra high-efficacy and premium quality provides a robust solution for high ceiling applications, especially warehouse spaces. Delivering high output, quality light and low energy consumption can improve warehouse safety and productivity, lower maintenance cost, and reducing operating costs. The Slim Profile Circular LED High Bay Provides high output illumination for various commercial industrial applications with high ceilings: warehouse, manufacturing, gymnasiums, cold-storage, wash-down areas. This Dimmable LED High Bay has a Rugged, die-cast housing with advanced thermal management system which ensures reliability and durability. Weather-proof, gasketed driver compartment protects electronics against environmental elements. IP66, wet location. Diffuser lens reduces glare and improves occupant working conditions while maintaining high efficiency emission. Our LED High Bay includes a 7-year Limited Warranty. See warranty documentation for more information. Luminaire utilizes high-efficacy LED packages maintained at cool temperatures for long life, high efficacy. Reliable driver features continuous dimming. Universal voltage (120-277V) for convenient installation. Comes equipped standard with 4‘ black SJTOW cord. Single point mount for hook, pendant, or stem mounting. Continuous dimming (0-10V) comes standard in this LED High Bay. Suitable for use with dimmers, sensors, daylight harvesting and other control strategies to achieve deeper energysavings and code compliance. Diffuser Specialist assumes no responsibility for suitability of luminaires and applications. Subject to changes without notice.